Click the links below for info and photos on the relevant years of the NZ Enduro Champs plus the section of features on aspects of NZ Enduro history. This page links to the Vinduro NZ site that is dedicated to the early history of NZ Enduros, from the start point in 1974 up to 1980s. The first decade of NZ Enduros were the years when almost all events were tough and the courses an eight hour all-day slog over a wide area of varied terrain, usually only covered once. Throughout this time the bikes had to be road legal to be able to cover the sections of public road between competitive sections. The seventies were also a time of remarkable camaraderie on and off the course and that story will take up more pages. Perhaps most remarkable aspect of the second half of the seventies and into the eighties was the massive development of dirt bike technology. Those technical developements would in turn create the further specialisation of the dirt bike into separate adventure, trail, trials, enduro and motocross streams, where only a decade earlier there was little to separate them all. Enduro has its roots in observed trials, a man verses terrain contest that goes back to the dawn of motorcycling itself prior to WW1. Motocross, or scrambles as it was first called, was a much more recent invention, yet it was motocross that would influence Enduro most from around 1980. From about that time speed in motocross style special tests would become more and more critical in results. 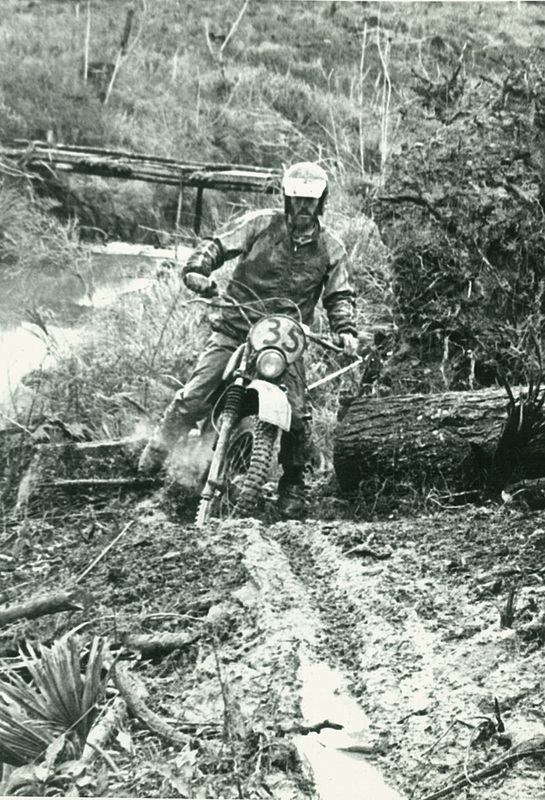 About the photos, top: New Zealand's first National Enduro round was a 2 day event held at Maramarua Forest at Easter 1976 as round 1 of a 6 round Championship. The photo tells a lot about the times and personalities of the coming decade. The three riders on the start line are Kevin Sargent (CZ250) John Nicholson (Yamaha 250 special) and Tjebbe Bruin (Husky 400). The bikes are all have short travel suspension and are modified in some way. Also in the photo (by the pole) are Bob Jackson, Ian Vinsen and other members of the organising AMCC. Riders in the back of the picture include Joe Van Lier, Phillip Thompson and Gary Wendt. Above: Les O Brien on an Yamaha IT400 at the 1977 Virgin Swamps Enduro in Riverhead Forest. This was back in the day when all events in Riverhead had to be held between June and October so naturally it was always a mud-slog. Les was one of the first national MX riders to give enduros a serious tilt. The black and white photo shows well the uncompromising track conditions. Virtually no track clearing was done, the riders rode raw terrain on what we now see as very basic machinery. One advantage the riders did have in their favour was that seat heights were generally lower . Note also that although many bikes have been over the track there is no rut. With lower power , less aggressive tyres and more rear weight bias the bikes of the seventies did not did deep ruts. In the background is an interesting bridge built of random logs with pallets for a deck. Waitemata MCC bridges in Riverhead these days are far safer!